We tailor each performances to fit the audience. However, we only perform for children... children ages 3 to 103. Typically our performances are 45 minutes with additional time for audience "Pictures with Puppets". This newspaper article highlights the first of our seven library performances throughout Massachusetts this summer and does an excellent job of describing one of our typical shows. 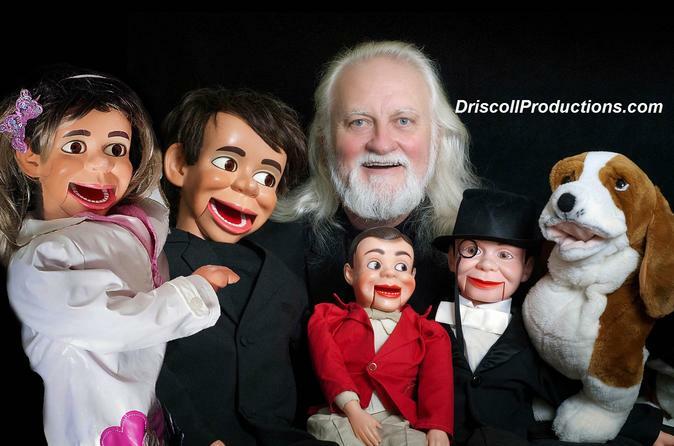 Kevin Driscoll brought his case that was full of different dummies and let the kids learn the basics of ventriloquism. Young children, along with parents and guardians, came to the Needham Free Public Library to see ventriloquist Kevin Driscoll on Monday, June 18. Driscoll, a former band director at Marlborough Junior High School, entertained the kids with his different ventriloquist dummies and collection of drums. The kids learned how to use different types of drums while also learning a little about ventriloquism. Kids got a chance to learn how use the different drums while also making a lot of noise. Samantha Riley, one of the parents in attendance, thought the event was fun for the kids - but unique, as well. Children got to learn about different drums, like the Irish bodhrán, Tahitian toeré, Trinidadian mini-steel drum, and many other percussion instruments, as they collaborated in one big jam session. One of Driscoll’s puppets was Doug the Talking Dog, who wouldn’t bite the kids, but would try to grab a drumstick or tambourine from them while they played. Part of the show even had volunteers coming up from the crowd to wear a ventriloquist face mask and play the part of the dummy. Children’s Supervisor Paula Dugan helped make sure the event was a success. The event was held, in part, to help spread the word about the summer reading program, which kicks off on June 26 for children 12 or younger. A young girl enjoys one of the many different drums that Driscoll brought with him. “It was wonderful to see so many children having fun, and our theme this year is music, so it fit in wonderfully with [that],” Dugan said. In addition to learning about different drums, kids also learned about basic music terms, such as what a crescendo and a tempo are. Walter Godoy, another parent in attendance, enjoyed watching his son play the drums. “I think it was amazing."